Sixty-eight years after being crowned the first National League Champions (in 1903), the Pittsburgh Pirates returned to the top of the National League evoking memories of their former glory. Many fans still remembered Bill Mazeroski's ninth inning blast that defeated the perennial champion New York Yankees in 1960 and now they were anxious to see Roberto Clemente win title #2. 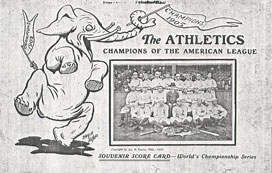 The "Buccos" had dominated the National League East (winning their division by seven games) and went on to beat the San Francisco Giants three-games-to-one in the Championship Series. The Baltimore Orioles had just completed their third successive American League Series sweep (over the Oakland A's) as well as their third one-hundred win season. They also became only the second club in Major League history (1920 Chicago White Sox) to feature four different twenty game winners in their rotation (Dave McNally, Jim Palmer, Mike Cuellar and Pat Dobson). Pittsburgh set the pace early on in Game 1 and knocked McNally for three quick, second inning runs, but the Orioles ace regained his focus and held the Pirates hitless from the third inning on. Of the three hits he did surrender, two were off the bat of Roberto Clemente - a future member of the 3,000 Hits Club, who had emerged as one of the top players in the National League. Despite "The Great One's" best efforts, Baltimore went on for the 5-3 victory, thanks to a three run homer from Merv Rettenmund and solo blasts from both Frank Robinson and Don Buford. Series vet, Jim Palmer followed with an 11-3 triumph in Game 2 that tallied a staggering fourteen singles. Brooks Robinson notched three hits and two walks while reaching base a record five consecutive times. Like Clemente in the opener, Rich Hebner accounted for all of the Pirates numbers with a three run homer in the eighth. 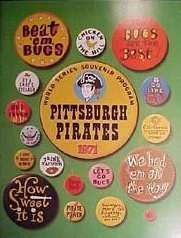 As the Series shifted to "The Steel City", the hometown Pirates took a considerable turn and showed what had made them National League champions. Steve Blass dominated the mound at Three Rivers Stadium in Game 3, tossing a three hitter while Bob Robertson matched his teammates numbers with a three run homer of his own. The final was a 5-1 victory that put manager Danny Murtaugh's team back in the race. Game 4 was the first of its kind to be played under the lights and the inaugural night game witnessed a clutch comeback by the "Buccos". Baltimore started strong with a three run first that ended with Pirate lefty Luke Walker hitting the showers. Twenty-one year old Bruce Kison came in as relief and pitched one hit, scoreless ball for 6 1/3 innings. Milt May, another young thoroughbred, knocked a game winning pinch-single in the seventh as the Pirates tied it up with a 4-3 triumph. The fifth meeting showcased even better pitching by an unlikely candidate named Nelson Briles. The Pirate novice had not seen much action during the regular season with only fourteen starts and four complete games to his credit. Experience apparently was not a factor though as he silenced all his critics with a brilliant, two hit effort that ended in a 4-0 decision that put Pittsburgh in the lead. On the verge of elimination, the Orioles dug in for Game 6 and held the Pirates to a 2-2 tie through nine innings. Sensing the desperateness of Baltimore's situation, Frank Robinson decided to end the contest himself in the tenth. First the speedy outfielder walked, then he stole second on a Merv Rettenmund grounder up the middle and finally reached home on Brooks Robinson's shallow fly to center field. The "Bird's" were still alive and looking forward to a Game 7, while the "Bucs" were obviously disappointed after failing to finish them off. Blass returned against Cuellar for the grand finale and neither blinked as Pittsburgh took its final at-bat in the fourth. To no surprise, Roberto Clemente stepped up to the plate and shattered the 0-0 tie with a tape-measure homer over the wall in left-center. Later in the eighth, Clemente's protégé, Willie Stargell crossed home on a Jose Pagan double. Baltimore appeared to position themselves for a comeback, after putting runners on second and third with one out in the last half of the inning, but only managed an RBI on a Don Buford grounder. After narrowly escaping the previous inning, Blass promised not to give the Orioles another chance. The intention would stand as the Pirate ace sat down all three Baltimore batters in a row. With the scoreboard reading 2-1, the Pittsburgh Pirates dethroned the defending World Champions for their fourth World Series title. Clemente was undoubtedly voted the "Buccos" MVP and totaled twelve hits in twenty-nine at-bats to finish with a .414 average. Teammate Manny Sanguillen hit .379 and infielder Bob Robertson added two homers and five runs batted in. Unfortunately the celebration in Pittsburgh would soon turn to mourning as a short fourteen months later Clemente was killed in a plane crash. The nationally revered icon was on a humanitarian mission that was taking supplies to earthquake victims in Nicaragua when the aircraft he was flying in went down off the coast of Puerto Rico. The bright black and gold banners that usually adorned the windows and streetcars of Pittsburgh (in honor of all their sports teams) were replaced by black wreaths and the #21 as the entire town remained shocked by the loss of their adopted son. It would take several years for the city's fans to recover although the pain would be numbed by the emerging Steelers dynasty of the mid-late 70's. In retrospect, it seems fitting that Clemente's own protégé, Willie Stargell, would be the one to return the Pirates franchise to their former glory a few short years later. Did you know that Game 4 , which was played on October 13, 1971 in Three Rivers Stadium, was the first World Series night game ever played? Bruce Kison , who appeared in two (2) games and finished with 6.1 innings pitched, tied the record set during the 1907 World Series when he hit three (3) batters during a single series. Roberto Clemente hit safely in all seven (7) games of the 1960 World Series AND all seven (7) games of the 1971 World Series making him perfect — at least one (1) hit in every Fall Classic game.